The idea is simple, really. Plunk yourself down someplace outdoors and sit still for 15 minutes—no electronic devices, no books, just your eyes, ears, and sense of smell wide open. What do you observe? 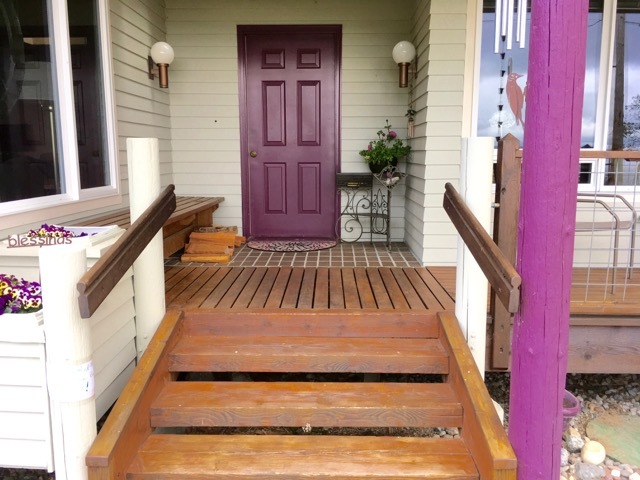 On Mother’s Day I was making a call to my dear 90-year-old mother while sitting indoors near our front picture window. It was early morning, chilly and overcast. 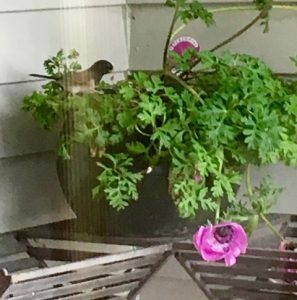 While talking with Mom, I noticed the little junco leave its nest on our front porch. Sign warning visitors to use the back door. Ten minutes later, still deep in my conversation with Mom, I noticed the junco return with an insect in its beak. The four blue, speckled eggs had hatched, on Mother’s Day, no less! Four junco eggs in the nest at our front door. After finishing my call with Mom, I began my Sit Spot exercise. 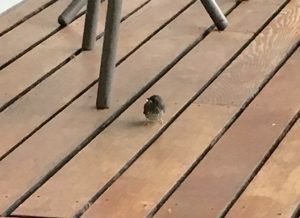 I actually could not go outdoors because there was no place to sit without interfering with the junco mother and father’s 10 minute feeding interludes. For nearly an hour I watched the faithful parents in their routine. Every day since then I have spent a lot of time at my Sit Spot. Baby juncos.. Photo taken by Christina Baldwin immediately after the parent junco went to get more food. A Sit Spot reaps the greatest rewards if you revisit your spot on a regular basis—i.e. become an expert on the comings and goings on your little piece of earth. 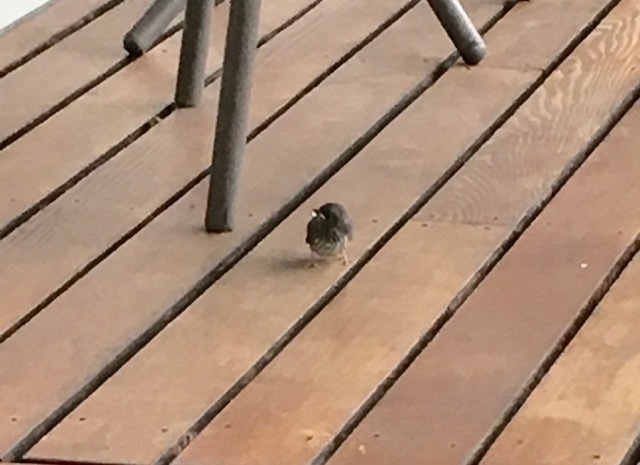 By watching the junco nest from first hatch to fledging these past 12 days, I have been stunned and amazed at the rapid growth of these little birds. 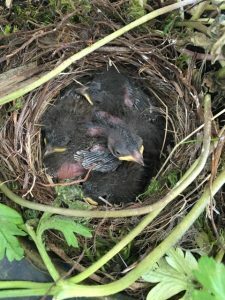 And I am really, really impressed with mama and papa junco who never, ever fly straight into the nest. They zigzag from nearby post to bush looking carefully for the presence of any predator and then dart in, feed their completely silent little charges, and head back out for more food. Now that the fourth and final young junco has left the nest, I have no way of tracking how the parents keep feeding their young or if marauding crows capture and eat one of the young. However, just two days after the final baby fledged I was reaching for the garden hose and one of the babies ran deeper into a bush, peeping all the way. I have gained deepest respect for the diligence of junco parents and am reminded again of the incredible fragility and strength of life. Beautiful story! Thank you for knowing it’s importance. Now, I am off to find a “sit spot”. Thanks for that too. Love you both! And an extra prayer of gratitude for the technology (yes, you heard ME write “technology” with a positive tone in my fingers) – i.e. digital cameras/cameraphones – that allows us to share visually in your Sit Spot moments. More and more often each day I find myself murmuring “thank you” for so much that often I have taken for granted!! (thank you, toilet; thank you, freezer; thank you, deck chairs) And thank you, trusting juncos! Lovely story, Ann! I have been creating my “sit spot” in my new nest. I have a few last things to plant, and it will all be done. I can be at my studio spot, making jewelry, in a chair reading a book (both indoors), or outside in my wicker chair. 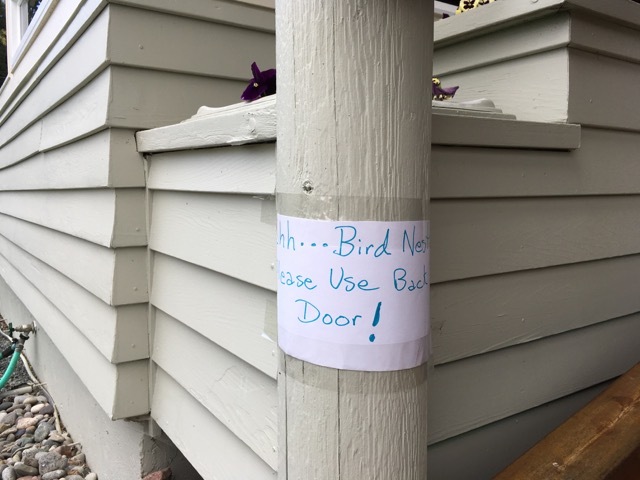 You’ve inspired me to get the last ingredients in place in time for some of our summer birds to nest again. 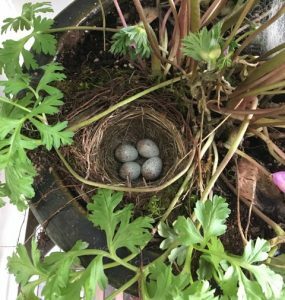 Just last week, in my sister’s weeping cherry tree just outside the front door at eye level with visitors sat a Turtle Dove atop her nest. I walked past, quietly, quickly so as to not disturb her, and it’s as though her eyes kept track of my progress. But she never ever budged. I got the impression nothing would scare her from that duty. Thank you for the reminder to sit, and listen and watch the things that are good in the world. I love the long days in the north, days when I typically get much more accomplished than any other time of year: and days when I can luxuriate in the light. The garden is growing, the tides are low, and the nearby forested state park is 50 shades of green. I like to be out on the patio in my “summer sit spot,” lap robe, hoodie, dreaming with the day and writing on my novel. When the sun comes round the corner of the house, the hoodie comes off, and it’s short-sleeve weather for the afternoon. About 1:00 PM the screen darkens in the blast of daylight and I shift to other tasks. This is my dream day. What amazing good fortune that I can have such days. And that we are alongside one another to have them together. Oh thank you. I needed this today. Out to my sit spot now without any distractions. Ann – lovely story of hope and care that naturally takes place with those parents for their young. Thanks for sharing the progression of their existence all the way until the young got their wings! Love the phrase “sit spot” too! Thanks for always reminding us to take time on the land in the outdoors. We always need that message!! In gratitude. Since it’s evening, I have a chair in mind to designate as my sit spot the first thing tomorrow morning. I’m now inspired to observe the simple sights that surround me, breathe the cool, fresh air, smell the scents of early summer and be grateful for all that surrounds me in the moment. Thank you for reminding me of the good that exists if we only look for it. Youth—Let’s Talk! What is a Sabbath?